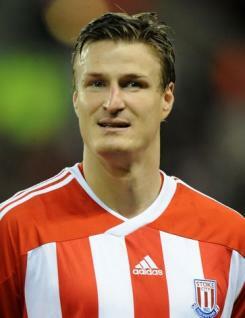 Robert Huth is a huge central defender who signed for Stoke City from Middlesbrough shortly after the start of the 2009-10 campaign. Robert can play at right back or in the centre of defence. He is cool and calm under pressure, with good distribution, while he has also developed the knack of scoring vital goals. A regular in the side since joining the Potters, he was again one of the star performers throughout 2010-11 and he was a deserving winner of the club's Player of the Season award. Robert began his senior career as a trainee with Chelsea, making his first-team debut at the age of 17. He then spent three seasons with Middlesbrough, but was often hampered by injuries during his stay at the Riverside. A member of the Germany squad for the 2006 World Cup finals, he currently has a total of 19 caps for his country.